For the first time since the Tennessee Supreme Court began requesting attorneys to voluntarily report pro bono work, more than fifty percent of Tennessee Attorneys reported doing some pro bono service during 2016. This benchmark has been a long-standing goal of the Access to Justice Commission, arising out of its 2012 Strategic Plan. "The Commission is extremely excited that Tennessee attorneys have donated their time and expertise to help us reach this level of pro bono service," said Gail Ashworth, Chair of the Commission. "The commitment and dedication of our attorneys to better the lives of their fellow Tennesseans is truly amazing,and we will work hard to continue this growth." As of December 31, 2017, 51.50 percent of the 17,223 active attorneys licensed in Tennessee with a primary address in Tennessee reported participating in pro bono activity during 2016. The report relies on data collected in 2017 for work performed in 2016. Both the number of attorneys who reported pro bono and the number of hours of pro bono work performed increased from the prior year. According to the Pro Bono Report, 8,869 attorneys practicing in Tennessee provided 652,555 hours of pro bono service, an average of over 73 hours per reporting attorney. The value of these services is estimated to be over $130 million. The majority of these hours (69.57%) were provided to persons of limited means without a fee or at a reduced fee. The 2017 Report marks the highest number of hours provided to persons of limited means without a fee or a reduced fee in five years. The second highest category of service was to nonprofit organizations serving persons of limited means without a fee at 13.06% of hours. Tennessee’s annual Celebrate Pro Bono Month, spearheaded by the Tennessee Bar Association and other access to justice partners, is held each October. Focus is given to the significant need for pro bono services and to celebrate the outstanding work of those who volunteer. Pro bono opportunities and volunteer training took place throughout Tennessee during October. The Tennessee Faith and Justice Alliance actively participated in Celebrate Pro Bono Month with Pro Bono & Faith Days, #PBFDays, from October 14-21. The TFJA sponsored three faith-based trainings, Faith and Justice Universities, across the state in Memphis, Nashville, and Knoxville. Approximately 100 faith leaders participated in these trainings, which highlighted regional projects. The Tennessee Supreme Court hosted or partnered with organizations to hold recognition ceremonies across the state to celebrate Attorneys for Justice and Law Students for Justice. Each spring, the Access to Justice Commission, and its partners, also hosts HELP4TN Days, which focuses on free legal advice clinics from Memphis to the Tri-Cities. 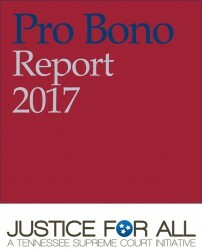 For the 2017 Pro Bono Report, the surveys used to collect information from stakeholders were redesigned using questions modeled from prior Pro Bono Reports, partner feedback, and new questions were introduced modeled after the ABA Standing Committee on Pro Bono & Public Service’s publication Supporting Justice: A Report on the Work of America’s Lawyers. The revised questions permitted certain questions to be asked of all or nearly all of our partners. The aggregate results indicate that the three most frequently reported types of pro bono activities were speaking at a non-legal event, providing training on legal issues, and participating in an outside legal clinic. The most frequently types of people who received help were single parents, ethnic minorities, and elderly persons. Twenty bar associations from various parts of Tennessee and seventy-nine law firms of all sizes responded to the call for information for the 2017 Pro Bono Report. Twelve bar associations reported that at least 25 percent of their members participated in pro bono projects. The majority of bar associations reported that their members provided free or reduced fee legal services to persons of limited means and supporting a legal clinic as the two most popular types of pro bono service their members provide. The law firms reported that over 675 attorneys participated in pro bono work, with seventy-eight attorneys in reporting firms recognized as Attorneys for Justice by the Tennessee Supreme Court. Forty-nine law firms reported that more than half of their attorneys provided pro bono service, and more than half of the respondents reported that 99 to 100 percent of their attorneys provided pro bono services. Providing advice, meeting with clients, reviewing or drafting documents, writing a letter, or speaking with other attorneys were the top five types of tasks reported through law firm pro bono programs in 2017. The Tennessee Supreme Court announced its Access to Justice campaign in 2008 and subsequently created the Access to Justice Commission, which is composed of ten members from across the state. The Access to Justice Commission provides collaborative leadership to create solutions and resources that address and eliminate barriers to justice for all. See the full Pro Bono Report here. More information about the Access to Justice Commission and pro bono opportunities can be found here.